Fill a tall glass with ice. Add 1.5oz Vodka, 1/2oz of Peach Schnapps. 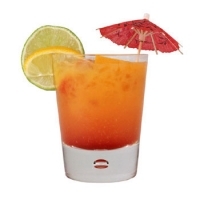 Fill the rest of the glass with equal parts of Cranberry Juice and Orange or Pineapple Juice. Shake, then garnish with an Orange or Pineapple. Enjoy! In a large shot glass, first pour 3/4oz Black Raspberry Liqueur. Then add 3/4 Melon Liqueur, and finally 3/4oz Jagermeister. ENJOY! Mix Southern Comfort and Lime Juice in a chilled glass and enjoy!